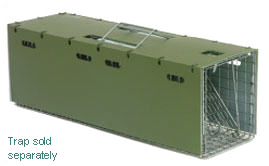 Safeguard Trap Covers made to fit the three most popular sized traps. These trap covers are constructed of heavy gauge green vinyl material, which is then hog-ringed together. There are (3) sizes. The (4) hinged panels, fold down over the top, sides and rear of a 18" x 5" x 5" squirrel trap, 24" x 8" x 7" trap or a 30 - 36" 11" x 12" Raccoon sized trap to form a solid walled "like" trap at much less cost. The covers are completely washable, and fold flat for easy storage inside a service vehicle. Traps sold seperately.